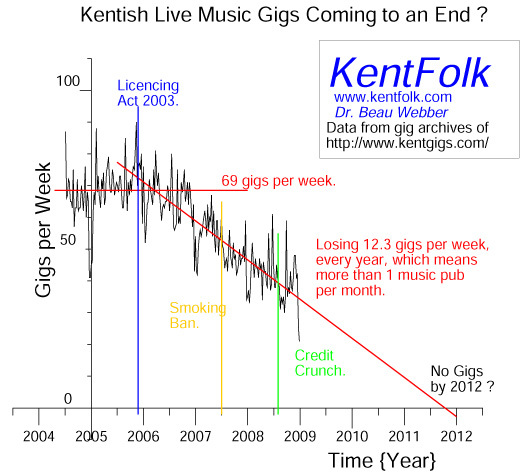 The Licensing Act 2003 is destroying live music in Kent. - and the evidence is that the Licensing Act 2003 is responsible. I have been saying we are losing music pubs and music-friendly Landlords at a frightening rate for a while, but now I have some hard numbers - and hard numbers they are to swallow - but if all things remain equal (and they never do), we could have no live music in Kent by 2012. Are Kentish and East Sussex Live Music Gigs Coming to an End ? At first look we have a quite a lot of scatter, then we can see that in fact some of the variation is a regular dip of some 20 or 30 gigs per week over the Christmas weeks, which makes sense. The Credit Crunch - starting late Summer 2008 into Autumn - There is a definite dip, but surprisingly the graph seems to have gone up again by Winter and the time of the regular Christmas dip - perhaps people are in need of compensation, and live music is a good option? The Smoking Ban - came into effect 1st July 2007 - Possibly there is a slight dip, but I do not believe there is any statistically significant change. The Licensing Act 2003 - came into force on 24 November 2005 - We see that what was a regular and fairly steady live music gig-rate of about 70 per week has turned within a month or two into a steady and apparently uniform slide towards zero. Now I am not one of those who found no merit in the Licensing Act 2003 - I agree the licencing fee takes most of the possible profit from the gigs I sometimes put on, but I do get a piece of paper that makes the gig legal. However what is totally unacceptable is that it would seem that for the publicans and musicians the scheme is unworkable, such that if everything is equal - and it won't be - we can expect no live music over the Christmas weeks next year (2009) - down from a recent 40 to 50 gigs per week over the Christmas period - and before the end of 2011 live music gigs will be effectively over or too far away to drive to. - The Licensing Act 2003 is destroying live music in one of the most musically active counties in the UK. What is it about the Licensing Act that is destroying pubs and the music ? Longer opening hours : Pushes up costs for the smaller pubs. Easier sales of booze in supermarkets : No need to go to the pub at all now. many of their suggestions (fewer pubs, etc.) are themselves consequent on the Licensing Act - but why ? For some of the suggestions there is no obvious reason that their effect should have suddenly have 'cut in' about Christmas 2005 - is there something else that I have not identified that changed then ? So ask your publican, chat with musicians, invite your neighbour to a pub gig and see what they say .... we need an answer and soon.